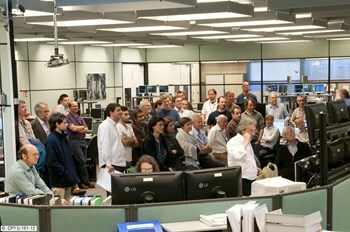 Eyewitnesses in the JET control room following the first plasma in eighteen months. Wednesday afternoon, the control room at the heart of the JET installation in Oxfordshire, UK was crowded and full of expectation. After an eighteen-month shutdown to upgrade the machine and four months of careful commissioning, the scientists were waiting to see the first plasma on the screen. The biggest part of this upgrade was to change the 4,500 tiles lining the vessel. The non-metal carbon was replaced by the metals beryllium and tungsten. The new materials are in accordance with the materials-mix chosen for JET's successor, ITER. With its new ITER-like wall, JET is the first fusion experiment to test beryllium and tungsten—which will be used inside the next-generation international experiment—together.